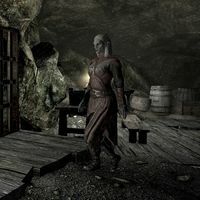 The Vampire Naturalist is a Dunmer vampire who can be found within the secret vampire lair in Cronvangr Cave during the related quest. [verification needed — when does she appear?] She is responsible for taming Arachnia, a blue frostbite spider she keeps locked in a nearby cage, whom she uses to harvest frostbite venom to torture her victims before drinking their blood. She wields an iron war axe in combat and wears vampire armor with matching boots. She carries the Spider Cage Key and Vampire Naturalist's Journal, along with a poison, some jewelry, and a small amount of gold. She drops a sample of vampire dust upon death. She spends her time wandering around the crafting area in the vampire lair, pausing to use the alchemy lab or stand over the desk next to Arachnia. She is hostile and you will need to kill her to obtain her key during the related quest. Pets of Skyrim: Find trained pets around Skyrim. This page was last modified on 9 September 2018, at 12:02.